Modi ‘magic’ is wearing off, Congress got more votes than BJP and farmers are angry with both parties. While Karnataka politics is in the grip of another round of expected horse trading and uncertainty, election results have thrown up a bunch of curious facts that should give food for thought to TV talking heads and commentators. Here are some of them. 1. Modi “magic” is over: Prime Minister Narendra Modi held 21 rallies in the state during the high-decibel campaign, targeting the Congress and praising his own govt. at the centre. So, it can’t be said that Karnataka’s electorate was not thinking about the Modi govt. and only concentrating on state or local issues. 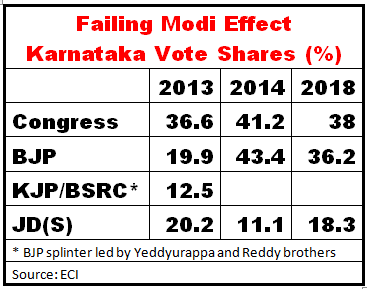 As the results show, BJP’s vote share has dropped by some seven percentage points since the 2014 general elections. In the 2013 elections, Yeddyurappa and the Reddy brothers had quit the BJP to float their own outfits KJP and BSRC. Adding up BJP’s vote share with these two, they had managed about 32.4% votes in 2013. From there they went up to 43.4% in 2014 and plummeted down to 36.2% in 2018. That’s a net gain of less than 4% in five years. This despite all the booth management of Amit Shah and the speeches of Modi. Surely, the “magic” is no more. 2. Congress has more votes than BJP: Strange as it may look but Congress has about 38% votes compared to 36.2% votes gathered by BJP. And yet, BJP has got 104 seats compared to 78 for congress and 37 for JD-S. This has happened because of two reasons. 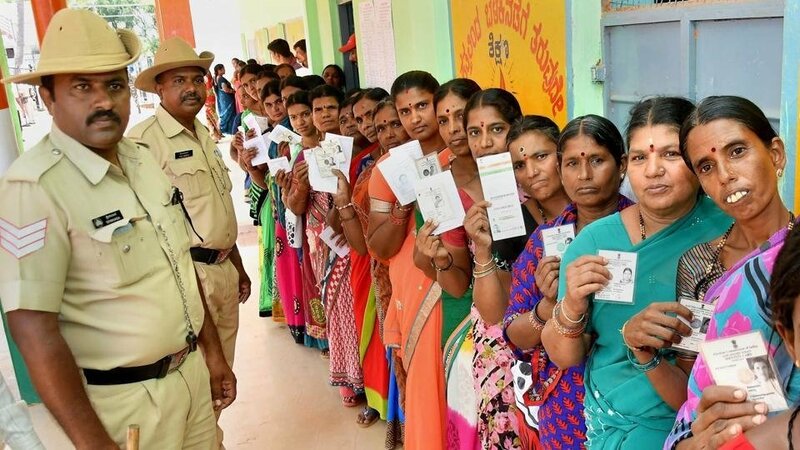 One, in three regions – Bombay Karnataka, Central & Malnad and Coastal – BJP has swept decisively winning 66 of 98 seats and getting a much bigger share of votes than the Congress. For example in Coastal belt BJP got about 52% votes compared to Congress’ 40%. And two, the related fact that average margins of victory for BJP were much more in these three regions than elsewhere. For example, in coastal region, BJP’s average margin of victory was 23,409 compared to Congress’ 8787. Statewide, BJP’s winning margins were not so much different – Congress was 15,818 while BJP’s was 18,954’. What all this means is that despite all the hoopla about winning Karnataka and opening the gates to the South, BJP is still behind the Congress in terms of public support. 3. BJP lost the rural and ‘rurban’ areas: In the state’s 150 rural seats BJP won 69 to Congress’ 51. But in terms of vote share BJP lost: they got 34.7% votes compared to Congress’ 37.4%. In the 20 semi-rural seats or ‘rurban’ seats, BJP lost much more heavily getting 32% votes compared to Congress’ 37%. Both parties shared 7 seats apiece, with JD-S getting 5 (23% votes) and others one seat. It was only in the 52 urban seats that BJP had an edge over the Congress getting 28 seats and 42% votes compared to Congress’ 20 seats and 39.5% votes. 5. Dalits and Adivasis were divided: Among the 36 SC reserved seats, Congress got more votes (39%) than the BJP (35%) but ended up with less seats. Conversely, in the 15 ST reserved seats, Congress got slightly less votes (38%) than BJP (40%) but got 8 seats compared to BJP’s 6. Clearly communities were not voting en bloc, as is often assumed. What these facts drawn from the detailed results show is that regional factors, farmers’ issues and jobs were the factors determining voting trends, often cutting across caste and regional lines. But the biggest conclusion is that the BJP – and its electioneering machine of Shah and Modi – have failed to win Karnataka. That is why, the post poll alliance of Congress and JD-S is a viable alternative. 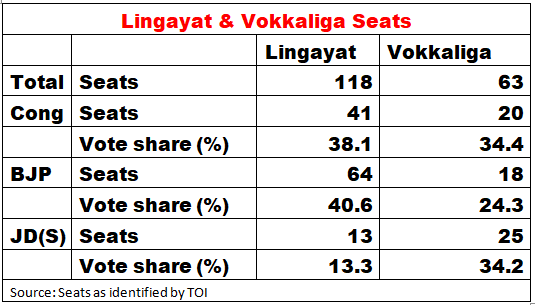 They have between them got over 56% of the vote share compared to BJP’s 36.2%.